One week ago, the Vancouver Warriors watched helplessly as a late, game-tying shot by Mitch Jones took an ill-fated bounce wide of the net handing them their fifth straight loss. 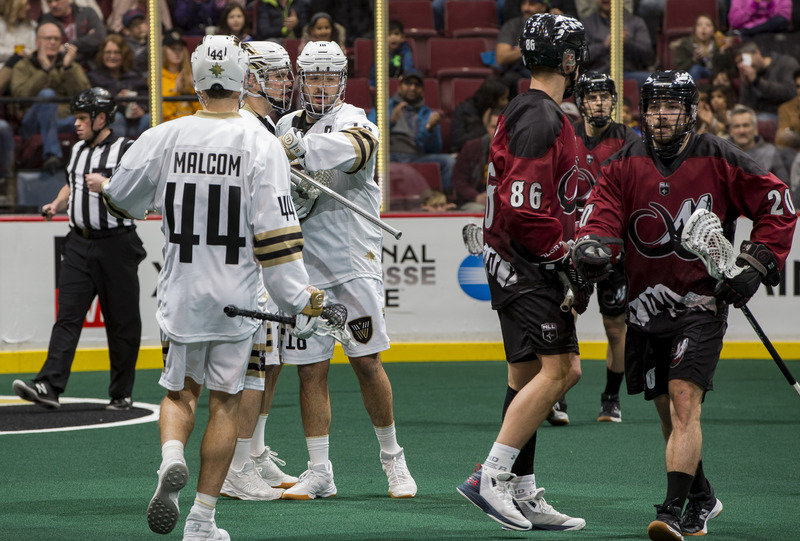 This week, however, on Saturday night facing the Colorado Mammoth Vancouver’s fortunes would take a turn for the better. After a 60-minute battle in which Vancouver never held the lead, they managed to force the game into overtime and in overtime, Logan Schuss heaved in the game winner giving the Warriors their first home victory of the season 11-10. Gaining the first possession of the extra period, Vancouver forward Mitch Jones promptly hit the post twice before Logan Schuss scooped a loose ball and threw it at Dillon Ward. The shot hit Ward’s stick and twisted it, sending the ball through his legs. The ball then caromed off the right post and into the net. For Schuss, a four-goal outburst brought an end to a mini two-game goalless slump and earned him the first star selection. Vancouver got a stellar performance from backup goaltender Eric Penney, who stepped in for Aaron Bold. Penney was solid throughout the game, but came up especially big in the fourth quarter, making timely saves off of Noble and Lee to keep the score close. And, as if to make up for last week, Vancouver was the benefactor of a couple of friendly bounces that went their way late in the game. First a Joey Cupido goal with 1:17 left was disallowed due to a crease violation and then a last-second shot by Jacob Ruest found the post and bounced out. Penny finished the night making 34 saves on 44 shots for a 0.773 save percentage. The Warriors’ defense has also been making a name for themselves with their aggressive style of play and it’s all centered around captain Matt Beers. As Vancouver announcers Brandon Astle and Brad Challoner pointed out, Beers is having himself a season. Early in the game, Beers and Justin Salt combined for a punishing hit on Mammoth speedster Cupido, dislodging the ball and creating a turnover. That level of competitiveness continued throughout the night as Beers was noticeable in almost every defensive situation for the Warriors. After giving up seven first half goals, the Warriors’ defense locked it down and surrendered only three more the rest of the way. For their part, the Mammoth played a solid road game. Leading for nearly the entire contest, the Mammoth settled into their typical game-plan: strong defense and great goaltending. On the offensive side of the ball, Eli McLaughlin had a terrific first half, scoring twice and assisting on two more including a beautiful cross-floor pass on Ryan Lee’s goal. McLaughlin was the straw that stirred the drink for Colorado’s offense as they went into halftime with a 7-4 lead. Things would change in the second half as Vancouver found a way to contain McLaughlin. Without McLaughlin’s ability to create chances, the Colorado offense seemed to stall. Chris Wardle managed to score twice, completing his hat-trick and Ryan Benesch added the only other goal of the second half. Perhaps the biggest chance for Colorado to generate some momentum came early in the fourth when rookie Kyle Killen belted Matt Beers with an open floor hit, sending him crashing to the turf. Despite the lack of offense, the Mammoth found themselves still holding the lead late in the fourth quarter. Unfortunately, it was not to be as Logan Schuss would tie it late and then win it for Vancouver in overtime. The loss drops Colorado’s record to 1-4 on the season, while Vancouver moves to 2-5. Ryan Benesch led all Mammoth scorers with two goals and four assists. His second goal of the night tied Paul Gait for 11th most regular season goals of all time with 410. Dillon Ward stopped 39 of 50 shots in the loss. Ian Hawksbee also made history for Vancouver as his second loose ball of the evening moved him into 10th place on the NLL all-time loose balls list. Hawksbee finished the night with a team leading 10 loose balls. Next week, both teams will take to the road as Vancouver will travel to Calgary to take on the Roughnecks and Colorado will head to Buffalo for a date with the Bandits.